Saturday 26th August see's the return of CraftWorks at Tyne Bank Brewery! 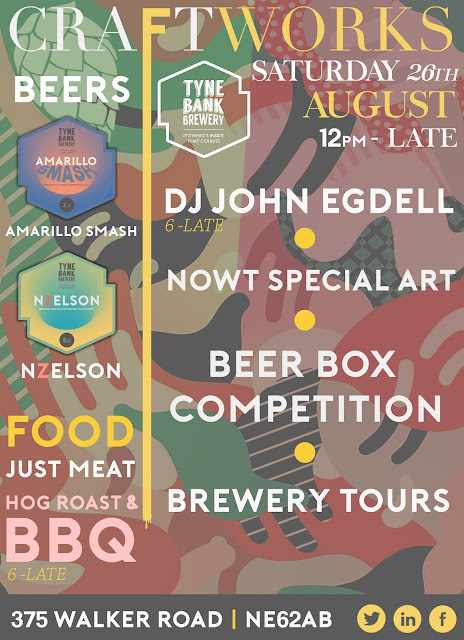 We've got new beers, Dj sets, Art on the walls, Hogs on the roast and a new beery competition to get involved in. We're giving you the opportunity to design, create and brew your own beer! At the event there will be a Beer suggestion box with accompanying forms, whether novice or expect, simply fill it out, design your beer from start to finish and drop it in the box! We'll go through the suggestions, pick a winner, contact you and invite you to the brewery to create your invention, the winning beer will then appear on the bar at the following CraftWorks complete with a personilsed pump clip! Pouring from midday will be NZELSON - We've brewed a full scaled batch of this juicy New Zealand IPA, loaded with Nelson Sauvin hops at 5.5% (ideal bank hol sipping). AMARILLO SMASH - A single malt, single hopped pale ale at 3.8% - All pouring cask and keg. The lovely guys from Just Meat Newcastle will be with us BBQ'ing a storm! Expect hog roasts, burgers, sausages and the works! Let's pray for sun.. Delighted to have John Egdell return, spinning tunes well into the night! Expect soul, funk and party classics.